The hardness of a coating material is a relative property that may be interpreted in a variety of ways by different industries that use coating/lining materials. 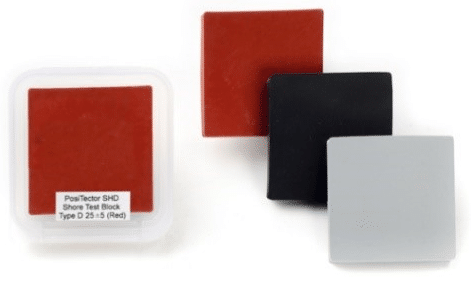 While hardness testing is frequently used to assess the degree of cure, they can also be used to measure hardness properties formulated into coatings. 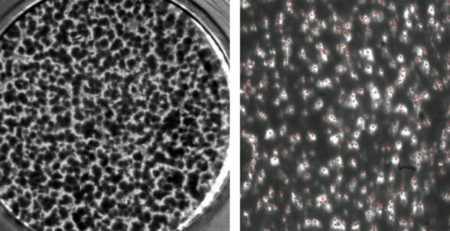 The absolute hardness of a coating is not always the ultimate goal of the formulation, and an increase in hardness can be accompanied by brittleness or a decrease in the flexibility of the coating. The balance of hardness with other final film properties is determined by the end use of the product. There are two common test methods described in this article: the indentor-type tester (Durometer) and pencil hardness, which is more of a sheer hardness test. The selection of the test method is frequently dictated by the thickness of the coating materials, although variations in the thicknesses tested are permitted if useful information can be obtained. 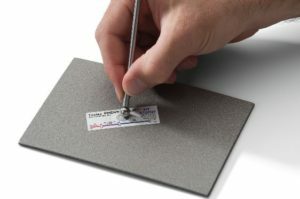 The hardness of thick film coatings (the method indicates “thick film” is considered a minimum of 6 mm or 240 mils) is typically measured using an indentor-type tester that measures the resistance to indentation under a specific spring force load, while thin film coatings (a reference to thickness is not included the method) are frequently assessed for the degree of hardness using the pencil hardness test. Note that there is no correlation between the hardness testing methods described herein and there is no pass/fail criterion indicated in the respective ASTM standard test methods. The project specification should indicate the minimum acceptable hardness value prior to placing the coating system into service. The minimum acceptable hardness value is often established by the manufacturer of the coating. Durometer hardness testing is performed according to the procedure described in ASTM D2240, Standard Test Method for Rubber Property – Durometer Hardness. This standard covers twelve types of measurement devices (Types A, B, C, D, DO, O, OO, OOO, OOO-S and R). 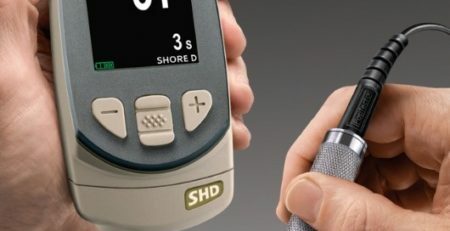 This article describes the use of a Shore D Durometer, since many of the thick film, chemically resistant coatings fall into the hardness range that a Shore D durometer can accurately measure. For softer, thick film coating materials, a Shore A durometer may be more useful since it has a lower spring force. According to the ASTM standard, Durometer hardness values less than 20 and greater than 90 are not considered reliable and it suggests not recording readings below 20 and above 90 for either the Shore A or Shore D instruments. 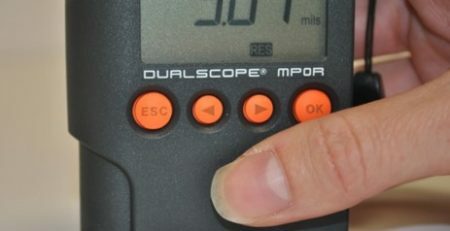 A Shore D Durometer is a small hand-held device (Figure 1) that is used to measure the indention hardness of various materials like hard rubber, plastics, soft metals, and epoxies and other coating materials. A small cone-shaped indentor protrudes from the pressor foot (the base of the tester). The durometer contains a calibrated spring that is used to apply perpendicular force to the indentor. Naturally, a cured, hardened coating will provide resistance to the indentor under the force of the applied load. This resistance to indention is displayed on the gage dial or digital display as a hardness value. The surface of the coating to be tested should be clean and smooth. Any inherent surface roughness may produce erroneous hardness values. Since temperature and humidity can influence the hardness value, the surface temperature of the coated surface and the relative humidity of the surrounding air should be measured and recorded prior to testing. While the temperature and humidity data is required to be reported by the ASTM standard, there is no correction of the hardness values based on the prevailing ambient conditions. 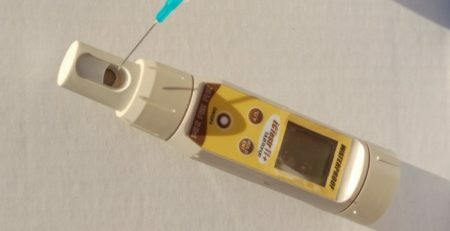 Digital durometers with separate (remote) probes (Figure 2) are becoming increasingly popular. 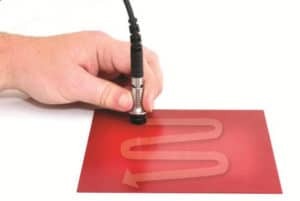 Their use is more amenable to curved surfaces because of the relative small diameter of the test foot compared to the base of the standard Durometer; however, the full measuring surface of the probe must sit flush on the surface without rocking to obtain a reliable reading. After verifying accuracy using the test blocks, the remote probe is pressed into the coating until the presser foot is in full, flat contact with the surface, and held in place. 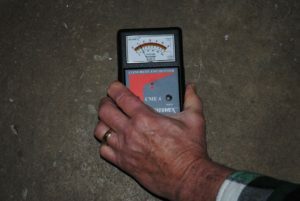 After the durometer emits a single audible signal, it will display a symbol indicating a reading is in the process of being obtained. The durometer will emit a double signal and display the measurement value. 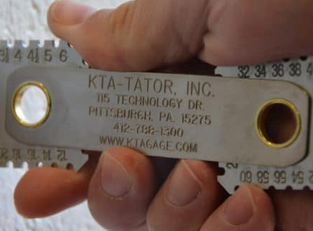 Durometers should be calibrated annually by the manufacturer or their authorized service center. 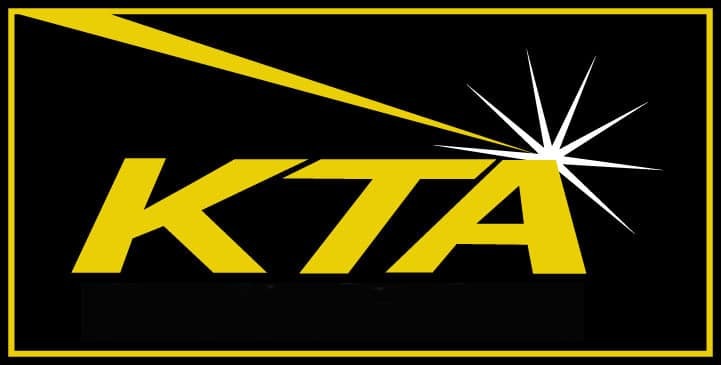 Some will even provide a 10-point calibration certification traceable to a National Metrology Institution like the National Institute of Standards and Technology (NIST). The operator cannot calibrate a durometer, but should verify proper operation prior to each period of use. Test blocks are used to verify proper operation. The set shown (Figure 3) represents hardness values of 25, 46 and 75 on the D scale. A measurement is taken on each test block and compared to the hardness value displayed on the durometer. If the value displayed by the durometer does not conform to the tolerance of the test block value (for example 25 +/- 5, which means that the displayed hardness value obtained on the test block can range from 20-30),the durometer should not be used to measure the hardness of a coating and should be returned to the manufacturer or service center for repair and calibration. Pencil hardness testing is performed according to the procedure described in ASTM D3363, Standard Test Method for Film Hardness by Pencil Test. Pencils containing lead centers with various hardnesses (shown in Figure 4) are prepared then used to attempt to scratch or gouge the coating. The coating’s inherent resistance to scratch or gouge damage is an indication of hardness. This test can be used on thin film coatings that cannot typically be evaluated using the indentor-type hardness testers. To conduct pencil hardness, a series of 14 drafting pencils representing various hardnesses of lead (from 6B to 6H; per Figure 4) and a piece of emery cloth or extra fine sand paper are required. The edge of the pencil lead will bevel or break, indicating the coating is harder than the pencil lead. Any time a pencil lead is re-used, it first needs to be “re-dressed” using emery cloth or sandpaper to regenerate the cylindrical-shaped end of the lead. The pencil hardness test method indicates that the testing should be conducted at a temperature and humidity conditions of 23 ± 2°C (73.5 ± 3.5°F) and 50 ± 5% relative humidity. Shop/field conditions will rarely conform to these ranges; therefore, hardness measurements obtained outside of these conditions should be reported with the actual conditions and noted as being obtained at conditions not listed in the method. Certified pencils are available for purchase, but calibration of the pencils is not normally performed since the cost for calibration frequently exceeds the cost of purchasing new pencils. Similar to durometer hardness, the results of this method can be altered by texture or defects on the surface and notation of any surface irregularities is suggested. What is a Base Metal Reading and How Does It Effect Coating Thickness Measurements? Calibration, Verification of Accuracy and Adjustment… Synonyms or Differences in Terminology?